To learn more about this video please click here. If you would like to see the trial version, please click here. PEGASUS is a video-course to enhance your analytical thinking skills, inspire creative approach to challenges and open your imagination turning you into a natural inventor. PEGASUS provides an algorithm that facilitates creating solutions for the challenges if standard solutions are not applicable. Use the PEGASUS when cheap and reliable solutions are to be delivered here and now. 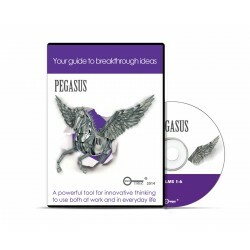 Students who study innovation will benefit from PEGASUS. Companies may use PEGASUS as a lunch time course. PEGASUS video course is based on TRIZ –Inventive Problem Solving System that guarantees reliable and resourceful solutions to any challenge. Most of the large manufacturing companies employ TRIZ experts to support their innovative potential. Address your challenges systematically with PEGASUS video course and open your talent to its full potential!